Seller: uniques77777 (1,138) 97.5%, Location: EUROPE, Ships to: Worldwide, Item: 133008196166 INSCRIBED " Diademed head of Zeus-Ammon right "Clear portrait of this historical giant !!! GOLD (22 - 24 karats) + SOLID SILVERGold is tested with "" liquid gold tester "" by dripping ((( not rubbed on stone to prevent damage to the item !!! )))Wearable 7.85 grams 21.00mm. = 0.84" Inner diameter Ptolemaic Kingdom of Egypt Ptolemy III Euergetes Zeus Circa (246-222 BC) Ptolemy III Euergetes (the Generous) is the son of Ptolemy II Philadelphus and Arsinoe he restored mint on beautiful octodrachmes and divisional involving his parents and grandparents, Ptolemy I Soter and Berenice. The Ptolemaic kingdom reached its zenith under his reign. In permanent conflict with the Seleucids, he invaded Asia Minor and pushed the Egyptian army until the Medes after the assassination of his sister Berenice, widow of Antiochus II. Unrest in Egypt, where Berenice II was regent forced him to end his successful campaign to regain the kingdom. At his death in 221 BC, he left an important empire which dominates the south of Syria and Asia Minor, Egypt and more.Numismatic Notes: Choice about extremely fine detail with a gorgeous patina ! 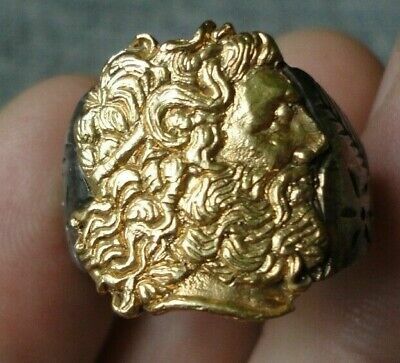 A stunning and exceptional example of this humongous RING !!! I purchased this item as an ancient relic but have no papers with the item, so bid at your own discretion !!! If you have second thoughts, please do not bid. I checking the item by EXPERT on determining the composition of the metal and it is GOLD(22 - 24 karats) Gold is tested with "" liquid gold tester "" by dripping ((( not rubbed on stone to prevent damage to the item !!! ))) + 100% SOLID SILVER and Silver have 100 % authentic GENUINE OLD PATINA.I do not restoration not repaired or renovated this item - to preserve the unique condition. Dear buyers, please keep in mind that we are dealing with ancient and antique items. You should not expect ancient and antique items to be as brand new ones. They always have some degree of wearing. Please, take care to examine the photos and read descriptions. Thank you. RETURNS : IF YOU HAVE A ISSUE WITH ANY ORDER FOR ANY REASON YOU CAN RETURN IT WITHIN 30 DAYS !!! SELLING HERE TO THE BEST OF OUR KNOWLEDGE AND IF YOU ARE IN ANY DOUBT ABOUT THE AUTHENTICITY OF A PIECE, YOU ARE MOST WELCOME TO SEND IT BACK TO US, WE WILL REFUND YOU IN FULL. WE HOPE TO HEAR FROM YOU SOON AND WE HOPE TO SATISFY EVERY VALUED CUSTOMER.OTHER : WE ARE SELLING ONLY AUTHENTIC ITEMS HERE UNLESS STATED OTHERWISE IN THE FORM OF 'STYLE' OR 'REPLICA'IF YOU HAVE ANY REASON TO DOUBT A ITEM THAT YOU HAVE PURCHASED, YOU MAY RETURN IT WITHIN 30 DAYS !! !Dear Customers, you will receive exactly the same item which you see on the pictures, not similar or other. Please read the description carefully and review the photos. All items, which I sell, are captured with high - photographic equipment and the photos, which I insert in my auctions, are with high resolution. The photos are absolutely clear and the potential buyer can truly identify the item, which purchased. Photos are not further processed by specialized software!Upon purchase my item, you will receive exactly the same item which you saw on the photo !!! The 12 pictures in listing are CLEAR with opportunities ZOOM for expansion so that you can perfectly identify all the details of item !!!!!!!! Thanks and have a nice day. Good luck and happy bidding Material: Gold 23K + Silver, Provenance: Ownership History Not Available, Customs Charges:: Zero Customs Fees !!! Popularity - Super high amount of bids. 100 views, 4.8 views per day, 21 days on eBay. Very high amount of views. 1 sold, 0 available. Super high amount of bids. 100 views, 4.8 views per day, 21 days on eBay. Very high amount of views. 1 sold, 0 available.